By far the most common form of transportation in Bali is the motor scooter. Which are also happily rented to tourists… “You want rent scooter?” At RP60,000 (AU$6) a day, and less for multiple days, the scooters are very cheap. Petrol is sold by small stores everywhere, usually in 1 litre vodka bottles that sit in racks out near the road. A bottle of petrol costs RP10,000 (AU$1) with 5 bottles filling a tank. A full tank of gas for a scooter will give a range of about 100km. Riding a scooter in the built up areas can be a little dangerous, with cars, taxis, trucks, motorbikes and other scooters to navigate through, not to mention people and dogs. It doesn’t take long to get the hang of it though, although nothing like the locals who slip in and out of traffic at tops speeds on both sides of the road. Keeping up with them is suicidal so it’s best to just ride at your own speed and try not to crash. Not crashing is important as the bikes aren’t insured leaving you the repair bill for any damage done. Crossing busy intersections can be a challenge and is usually done by slowly edging forward until the traffic stops and lets you go. There are traffic lights in Bali but not many and for most locals, red lights mean ‘go’ as long as there isn’t a larger vehicle in the way. The biggest danger on country roads are the Police Stops. While they occasionally pull over locals, they always pull over tourists. To ride a scooter you’re supposed to have either an international license or a local license gained from the central police station for RP250,000 (AU$25). Most tourists don’t have them, so when a tourist is pulled over without a licence the officer takes them aside and explains the fine system. Either pay the officer RP500,000 (AU$50) or get a ticket to pay at court for RP1,000,000 (AU$100). The police, however, prefer you to pay the RP500,000 which goes straight into their pockets. With low salaries, the police try to bolster their take home pay in this way as long as there’s no paper trail. The way around this corrupt method of fines is to demand a ticket and thus create a paper trail. The other way is to only have a small amount of money in your wallet and to let them have it. My brother and I were only pulled over only once and purposefully had only RP50,000 (AU$5) in our wallets. When the officer demanded the rest we simply shrugged and said that’s all we had…for petrol. He sighed and said, “I tell you what… I let you off this time.” He took the money and let us go. An hour south of our hotel in Kuta is a private park housing a 23-metre tall bust of the hindu god Vishnu. While the statue is quite prominent it’s only the beginning of the intended statue. Eventually, it’s to be 146 metres tall, gold-plated, with Vishnu on the back of Garuda, King of Birds. In another part of the park there’s the beginning of the statue of Garuda. The park, while small, has many interesting features, including the Lotus Pond, which is an open area with rocky sides where walkways have been carved into the rock. Our second spot of the day is a water temple built in the 11th century. Pura Luhur Uluwatu is on the south-western end of the South Kuta Peninsula in southern Bali and is one of seven sea temples built to protect Bali from evil spirits. While the temple is situated on a clifftop it was very humid while we were there. We were also warned about the monkeys in the area as they will steal anything not bolted down. We only encountered one and he seemed content to leave everyone alone. Like all temples in Bali it is required that you wear either a sarong or a coloured sling of fabric. On the south-eastern side of South Kuta is Nusa Dua which is a collection of 5-star hotels and calm beaches. The area was quieter than Kuta but the beaches were not as grand. Our first stop of day two after driving through the traffic heavy roads of Bali’s provincial capital, Denpasar, was the Elephant Cave, near the touristic township of Ubud. Built in the 9th century, the cave was used as a sanctuary. In the 1950s more of the surrounding area was excavated and a temple built around the site. Hawkers demand you buy a sarong when you arrive, but this is just a money-making scheme as sarongs are provided free at the entrance. Further north from Goa Gajah is the Valley of the Kings. Two sets of 5 death monuments are carved into the rock walls at this temple, which is dedicated to two different kings and their families. On either side of the valley are numerous tiers of rice paddies. Our last stop for day two is the most touristic temple in Bali, the beautiful sea temple of Tanah Lot. 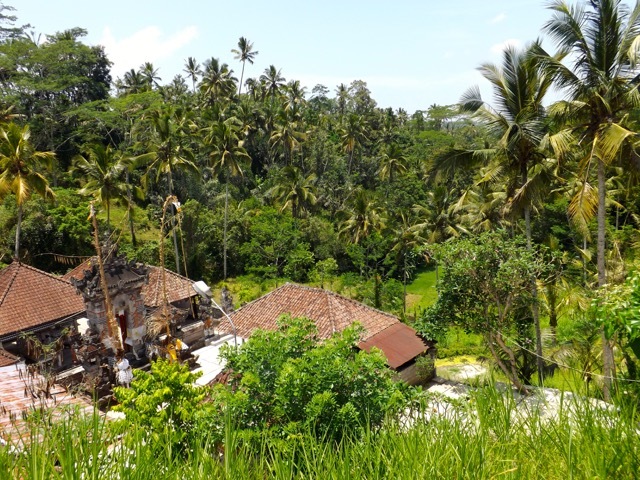 Tanah Lot means ‘Land in the Sea’ and is another of the temples protecting the island from evil spirits. The site has crumbled over the centuries and was threatening the temple itself. The Japanese government stepped in to help Bali protect the area. After 2 long days, 194km of road, and many hours of sore bottoms, our scooter excursions proved to be some of the most fun times in Bali. Something not to missed. After three weeks on the island of Bali, it’s time to begin the real travelling. Next we head to the island of Java and the city of Surabaya.